The graph shows changes in the amount of fish, salt and meat eaten per person per week in China between 1985 and 2010. 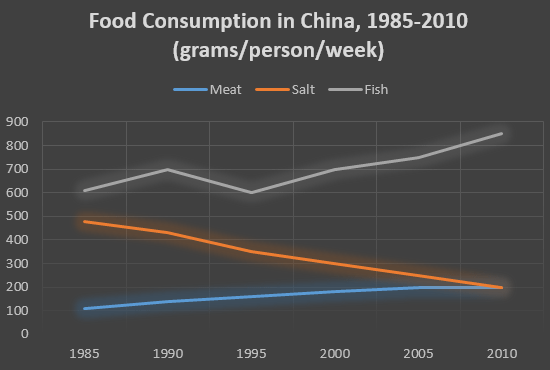 From the graph we can see that people in China consumed more fish than either meat or salt throughout the period. In 1985, the consumption of fish stood at 610 grams, then increased to 700 grams in 1990. Although it dipped in 1995, it then rose steadily and reached 850 grams in 2010. In contrast, there was a consistent drop in salt consumption. The amount consumed decreased steadily from almost 500 grams per person to only 200 grams by 2010. The amount of meat consumed weekly started at about 100 grams. However, this gradually increased throughout the period. By 2010 it was at the same level as the consumption of salt. Overall, the consumption of fish rose, while the consumption of salt fell. In addition, the consumption of meat, while at a relatively low level, rose significantly during this period. It is best to use amount and quantity for uncountable nouns, although both are used for countable nouns as well, particularly quantity. The amount of consumption decreased in the last 25 years.
?) In 1985, the consumption of fish stood at 610 grams, then increased to 700 grams in 1990.
?) The amount consumed decreased steadily from almost 500 grams per person to only 200 grams by 2010.
?) However, this gradually increased throughout the period.
?) Overall, the consumption of fish rose, while the consumption of salt fell.
?) The amount of meat consumed weekly started at about 100 grams.
?) From the graph we can see that people in China consumed more fish than either meat or salt throughout the period.
?) By 2010 it was at the same level as the consumption of salt.
?) In contrast, there was a consistent drop in salt consumption.
?) Although it dipped in 1995, it then rose steadily and reached 850 grams in 2010.